The Nemean Lion is one of the most famous beasts of Greek mythology. A man-eating lion with an impenetrable skin and claws that could cut through armour, the Nemean Lion would be encountered by the Greek hero Heracles during one of his adventures. ​Hesiod (Theogony) would name the Nemean Lion as the offspring of Orthrus and the Chimera, two other famous monsters within Greek mythology; although in the Bibliotheca (Pseudo-Apollodorus), the Nemean Lion is named as the child of Typhon, probably by Echidna, and indeed Echidna and Typhon were the parents of most of the main Greek mythological monsters. Less commonly, the moon goddess Selene is named as mother of the Nemean Lion, possibly by Zeus, or perhaps Selene simply nourished the lion in its youth. ​Others tell of how it was Hera who helped to raise the Nemean Lion, and thus it was the wife of Zeus who transported the Nemean Lion to the Peloponnese. Subsequently, the Nemean Lion was said to live in a cave upon Mount Tretos in Nemea, hence the name of the lion. The cave of the Nemean Lion had two entrances, one which faced Argolis and one which faced Mycenae, and the land around the cave was ravaged by the man-eating lion. ​Some fanciful tales tell of how the Nemean Lion would capture local maidens, instead of killing them, and thus the local menfolk were duty bound to try and rescue the women. The skin of the Nemean Lion could not be penetrated by mortal weapons though, and the claws of the beast were sharper than any mortal sword, and thus the Nemean Lion could cut through even the strongest of armour. Thus the men folk of Nemea continued to die, and the land around the cave of the Nemean Lion was abandoned. ​The killing of the Nemean Lion, and the retrieval of its hide, would become the first Labour appointed to Heracles whilst the Greek hero was in servitude to King Eurystheus. King Eurystheus would be guided in his actions by Hera, for the wife of Zeus, had an intense hatred for Heracles, the son of her husband. The belief held by King Eurystheus was that Heracles would be killed if he faced the Nemean Lion, and indeed this was the reason why Hera was said to have nurtured the beast. Unaware of the invulnerability of the Nemean Lion, Heracles set out for Nemea, and as he came to the town of Cleonae, he was welcomed into the home of Molorchus. 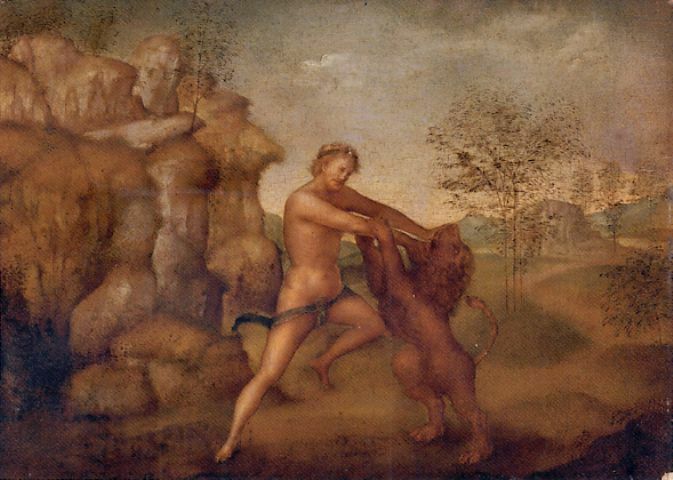 Molorchus offered to make a sacrifice to the gods for a safe lion hunt for his guest, but instead Heracles asked that Molorchus waited for 30 days, so that a sacrifice could be made to Zeus for a successful hunt, or else a sacrifice could be made to honour the death of the hunter. Heracles wandered through the Nemean countryside, and was surprised to find bountiful farm land being left to waste; eventually, Heracles came across the reason for this abandonment, for near to its cave, Heracles located the Nemean Lion. Heracles would take up his bow and arrows, and was more than slightly surprised to find that his arrows had no impact upon the beast and its impenetrable hide. Realising that his long range weapons were useful, Heracles quickly concocted another plan. Firstly, Heracles blocked up one of the entrances to the lion’s cave, and then the Greek picked up his club, and advanced upon the lion. 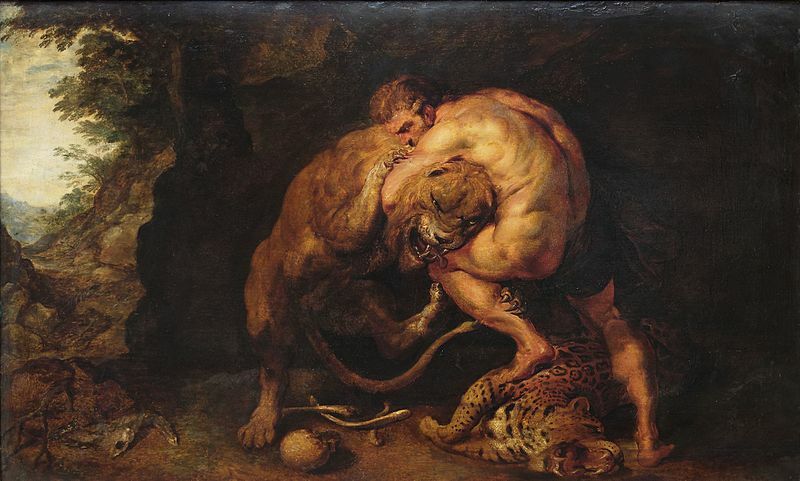 The club could not cause physical damage to the Nemean Lion, but Heracles did force the Nemean Lion backwards into its cave, and in the confined space, Heracles then started to wrestle with the monster. Ensuring that the claws of the Nemean Lion could not do him any harm, Heracles grappled with the lion until the hero managed to get a stranglehold upon the neck of the lion, and slowly Heracles chocked the Nemean Lion to death. It was said that after its death Hera would place the likeness of the Nemean Lion amongst the stars as gratitude for its efforts in attempting to kill Heracles, and thus the Nemean Lion became the constellation Leo. Heracles now tried to remove the hide of the Nemean Lion, but his own weapons could not cut away the skin of the beast, but the goddess Athena was looking down upon her half-brother, and so Athena advised him that the claws of the Nemean Lion could be used to cut through the hide. Heracles with the hide of the Nemean Lion draped over his shoulders now set out on the return journey to the court of King Eurystheus, although first he stopped off at the house of Molorchus, and the sacrifice to Zeus was made by both men. Heracles would travel onwards to Tiryns, but when King Eurystheus saw him approach the city, the king was fearful of the strength of Heracles, if he had overcome the Nemean Lion. Thus, Heracles was forbidden by the king to enter Tiryns again, and the hero was quickly sent off on another seemingly impossible task, the slaying of the Lernaean Hydra. Heracles would therefore set out for Lerna with the skin of the Nemean Lion draped over his shoulders, offering the hero protection from all elements and weapons.